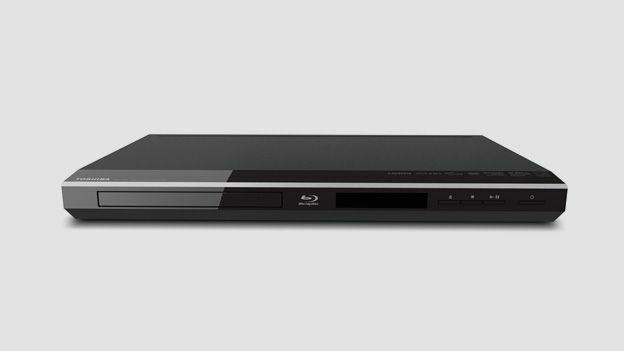 The Toshiba BDX1250 may not be packed with features like the high-end Denon DBP-2012UD, but on the plus side it is one of the more affordable Blu-ray players around, like the LG BD670. Does it offer enough for you to consider investing? We put it through its paces to find out. The BDX1250 is a dull, plasticky black box with no eye-catching features to speak of, but it's inoffensive enough and the slim, compact dimensions allow it to slip into your AV rack with minimal fuss. There's no USB port on the front, just a smattering of buttons and a small display panel. On the back Toshiba has supplied the bare minimum of sockets, including a single HDMI output, which isn't 3D compatible, a coaxial digital audio output and an Ethernet port for BD Live access. Naturally the BDX1250 does all of the Blu-ray basics, such as supplying 1080/24p pictures to your TV, accessing BD Live and decoding Dolby True HD and DTS HD Master Audio. But beyond that there's very little to get excited about. The lack of DLNA networking, internet content and 3D support could normally be explained away by a low price tag, but the RRP of £140 puts it in the same price bracket as decks from the likes of Samsung, Sony and LG, which offer loads more features. The BDX1250 can be found online for under £100, but so can its superior rivals. However, the BDX1250 does offer support for a decent range of digital formats through the USB port on the back, including MP3, JPEG, DivX, MKV, AAC WAV and AVCHD. What's more there's a range of picture adjustments in the setup menu, which aren't always found on players at this price. They're not particularly detailed and it's tricky to check how the results of your tweaking affect how the movie looks, but it's nice to have them. Using the BDX1250 is a piece of cake. The Setup Wizard sets all the basics, and after that you can tinker around in the smart setup menu, which lays out the options in a clean, confusion-free manner. The remote is small and fiddly to use though, and its build quality feels as cheap as the player itself. However for all its faults the BDX1250 actually delivers some great looking HD pictures. There's plenty of intricate detail on display, motion is fluid and judder-free and colours are always believable – not washed out or garish. Dark scenes are also impressively rendered too. Disc loading is fairly fast, taking just over 43 seconds to load discs with Java-heavy menus. Music playback isn't particularly polished, making our range of test tunes sound a little congested and flat, but it's OK for everyday background listening. Most of the latest budget Blu-ray decks offer fancy features like DLNA networking, web content and 3D support but Toshiba appears not to have got the memo. The BDX1250 is stripped of any eye-catching features, instead focusing on playing Blu-ray discs and digital media from USB. Looks and build quality are disappointing too. To be fair, this stripped back spec is an inevitable side-effect of the price tag, but with far more talented players within touching distance, it might be worth looking elsewhere, starting with our list of the Best Blu-ray players around.